It's not often that you can blow two separate two-goal leads on the road (especially against a quality opponent), but the Penguins did just that in a 5-4 overtime win over Chicago. The win leaves the Penguins just one point behind eighth-place Buffalo in the Eastern Conference. It's certainly a nice way to start their five-game road trip. Yes, the game-winner in overtime was scored by Evgeni Malkin, which was no surprise, especially considering he was calling for the puck. But it was the presence of some other names on the scoresheet that should be encouraging to Penguin fans. Staal. Satan. Talbot. And in a nice touch, Chris Kunitz. Welcome to the Pens, young man. The Pens (sans Sidney Crosby for the second straight game) overcame a hat trick from Jonathan Toews, who would have had four goals if one was not disallowed in the second period. 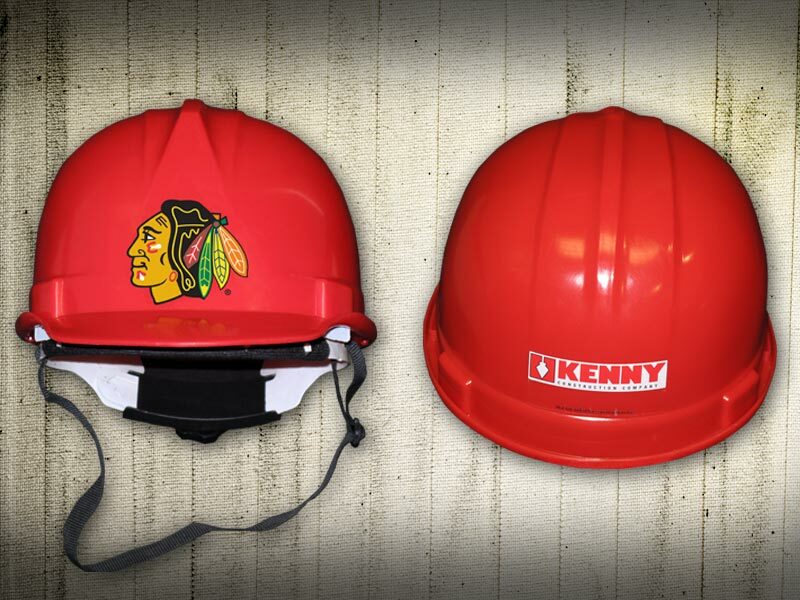 That non-goal caused numerous Hawks fans to tragically toss their freebie Blackhawks construction helmets onto the ice. I'm sure helmet sponsor Kenny Construction was thrilled that their goodwill gesture was heaved by hundreds of fans. Comparing the Penguins to a Simpsons episode for the second time in a week, I must say that this incident reminded me of the episode where Marge started selling pretzels and sponsored a giveaway at the Springfield Isotopes game, only to have fans throw them in disgust when Mr. Burns won the fan giveaway for a 1997 Pontiac Astro Wagon, knocking Whitey Ford unconscious and creating the term "Whitey Whackers". Needless to say, Marge's pretzel business soon went under due to the free sample gone wrong. But back to hockey...and don't look now, but the Penguins are 4-1-1 under Dan Bylsma. And keep in mind that Crosby has not played in two of those six games. Yeah, I know Gene Collier probably still thinks the season is over, and while I'm pretty sure this isn't "the" year, I sure wouldn't mind a little playoff excitement coming to town in the near future. The Pens' second-season push resumes on Sunday at 3 PM against Dallas. I wonder if Tony Romo will be there to sabotage another Dallas-Pittsburgh game? We could use some of that in the next game against Washington. --Lots of great pictures from last night's contest at Empty Netters. - As I pulled into a parking lot near the United Center, I was directed into a space behind a car with a Steelers license plate frame. Great start to the night. - Walked into the United Center, and I have to say I was pretty impressed. For a building that's almost 15 years old, the place has a lot of nice features and is laid out pretty well. We found our seats easily and the view was pretty good, even from the upper bowl. Not to mention the place is HUGE. Over 22 thousand were there last night, they didn't mention if it was a sellout. If this is how nice a 15 year old arena looks, us Pittsburghers are in for a real treat when the Consol Energy Center opens up. - Upon entering the bathroom for my ritual pre-game urination, I found a Pens fan and a Hawks fan going back and forth about Chicago sports vs. Pittsburgh sports. The Chicago guy was getting pretty desperate, because the Pens fan had already pointed out that we recently won the Super Bowl AND the Eastern Conference Championship, so he was left with only one other option. "Alright, let's talk about those Pittsburgh Pirates!" (At this point it's important to note that the guy was wearing a Cubs hat.) Without skipping a beat, the Pens fan goes "OK, well we won the World Series 30 years ago. How about you?" ....... Down goes Frazier. - I was also impressed with the amount of Pens jerseys I saw. From the parking lot to our seats, we saw back and gold (and powder blue) all over the place. My best guess would be about 30-35%. At the end of the 2nd period when Satan and Talbot scored back to back, there was a nice yelling match going on between "Let's go Pens" and "Let's go Hawks". It sounded pretty even, if not a little in favor of the Pens fans. Tangradi's stock just went up in my book.